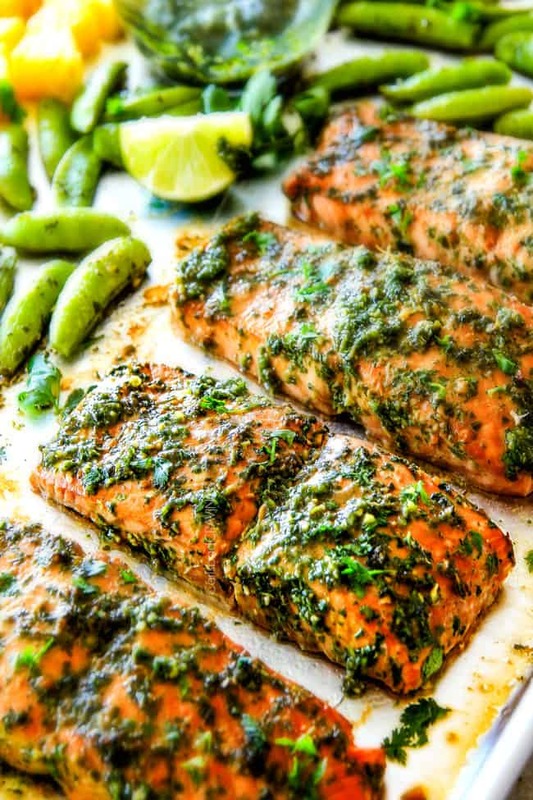 Obsessive worthy Sheet Pan Asian Chimichurri Salmon is wonderfully juicy, tender, and flavorful all baked with crisp tender snap peas and fresh sweet pineapple in ONE PAN for an easy, satisfying meal-in-one. that tastes totally gourmet! 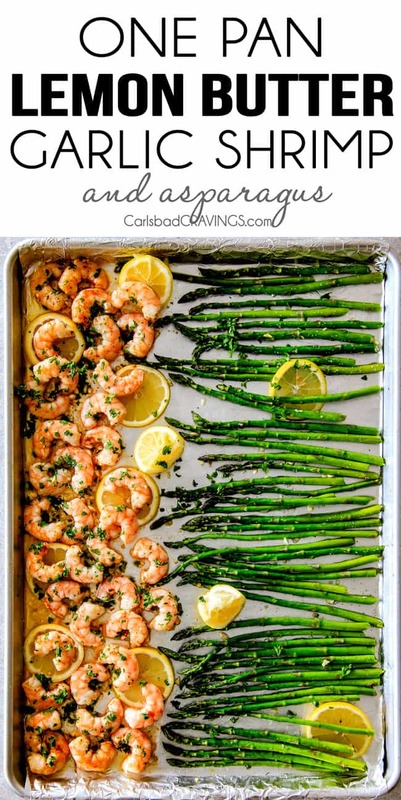 You will fall in love with this sheet pan wonder! I hope you enjoyed the Sheet Pan Asian Chimichuri Salmon Recipe Video! I have been making my own recipe videos since mid February and posting them to Facebook but have yet to include them in a post (long story) but am excited to start adding them! I’ve already added the video to my Baja Fish Tacos and will continue to add them throughout the week. You can check out some of my videos on FB HERE. And while you’re visiting, be sure to follow my FB Page if you are a true foodie because I share tons of awesome recipes from other bloggers and networks! 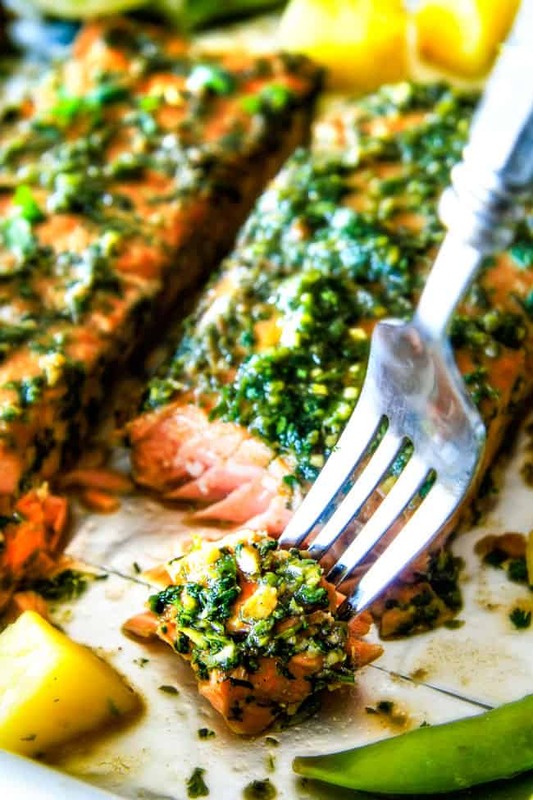 The star of this Sheet Pan Chimichurri Salmon is the Cilantro Basil Chimichurri. I am giddily obsessed with it – can we say FLAVOR?!! 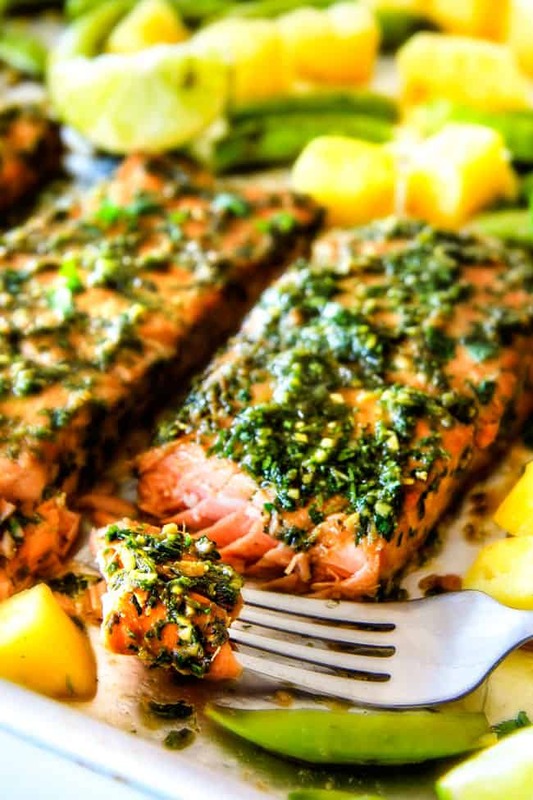 Traditional Chimichurri is a South American sauce typically comprised of parsley, garlic, red wine vinegar and chili pepper flakes and adds a dynamic, fresh, often spicy flavor to anything it adorns. To play with the flavor profile, I swapped parsley for cilantro, basil and mint, swapped red pepper flakes for jalapeno, red wine vinegar for rice wine vinegar and spiked it all with ginger, hoisin, fish sauce and lime juice. The resulting Asian Chimichurri is bright, fresh earthy, and soooooo flavorful! Now, don’t be scared off by the length of ingredients for the Asian Chimichurri. They all get dumped into your food processor so it literally take MINUTES to make! And every ingredient is hand selected to make the most dynamic Cilantro Basli Chimichurri ever that we use in the marinade, with the peas and again to finish – so it is well worth the ingredients and the minutes it takes to whip up :). Once we make our Asian Chimichurri, we immediately put it to work by adding 1/2 cup to some soy sauce to create a simple, quick marinade. Many Sheet Pan Fish recipes don’t marinate the fish/chicken, but I find this leaves all the flavor on the outside instead of seeping through and through – and we want flavor through and through. Plus, while your fish marinates for just 30-60 minutes, you can get a jump on chopping your pineapple and trimming your snap peas. Next, add a little brown sugar and olive oil to your pineapple and roast for 5 minutes. Add your snap peas and toss them with some more Asian Chimichurri, olive oil, salt and pepper followed by our salmon and bake for 15 minutes or so and out comes crazy flavorful, savory seeping Asian Chimichurri Salmon, sweet roasted pineapple and crisp tender snap peas – all of which are exquisitely delicious on their own but together comprise the perfect bite after bite after bite. 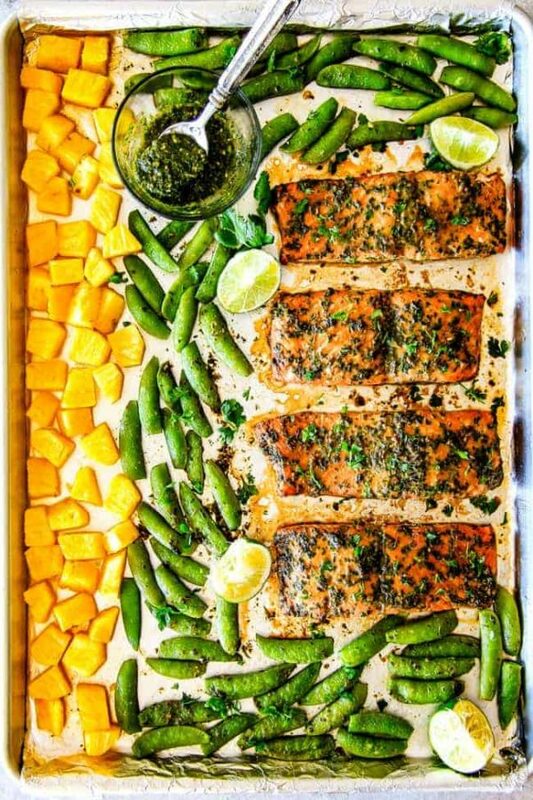 Sheet Pan Asian Chimichurri Salmon – another healthy Sheet Pan Dinner to add to your arsenal of quick, easy dinners with the sides built i! Enjoy! 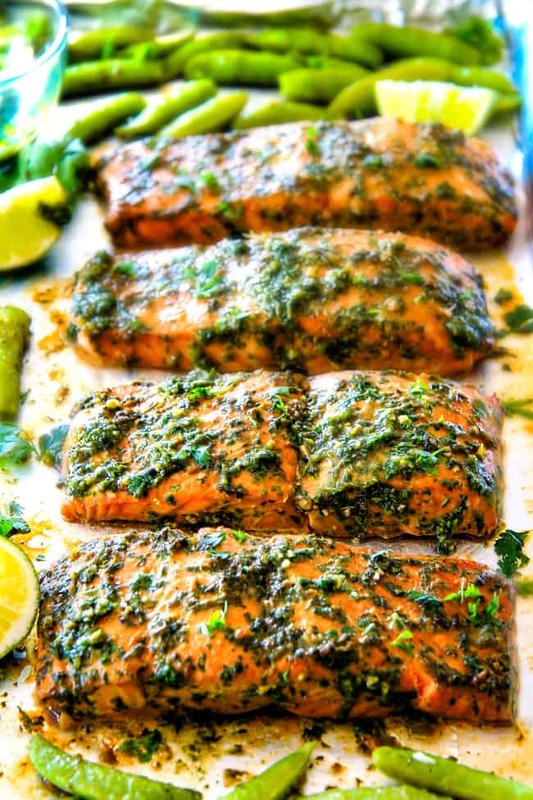 Want to try this Sheet Pan Asian Chimichurri Salmon? Pin it to your SHEET PAN, SEAFOOD or ASIAN Board to SAVE for later! Add cilantro, basil, mint, garlic, ginger, green onions, and jalapeno (without seeds) to food processor and pulse until coarsely chopped, pushing sides down as needed. Add olive oil, hoisin sauce, rice wine vinegar, fish sauce, lime juice, salt and pepper and continue to pulse until finely chopped and well combined. If you like more heat, add some jalapeno seeds to taste. Remove ½ cup chimichurri to a shallow large bowl/dish or large freezer bag and whisk together ¼ cup soy sauce. Add salmon and marinate 30-60 minutes at room temperature. Meanwhile you can prep your pineapple/snap peas. When read to bake, preheat oven to 400 degrees F. Line baking sheet/jelly roll pan with foil and spray with cooking spray. Add pineapple, 1 tablespoon brown sugar and one tablespoon olive oil and toss to coat. Bake 5 minutes. NOTE: I used a large jelly roll pan but everything will fit on a baking sheet - it will just be snug. Remove from oven and add snap peas. Toss peas with 1 tablespoon olive oil, 1 tablespoon chimichurri. 1/4 teaspoon salt and 1/8 teaspoon pepper. Push pineapple and snap peas to one side of the pan. Dab excess marinade from salmon with paper towels and add to pan with pineapple and snap peas. 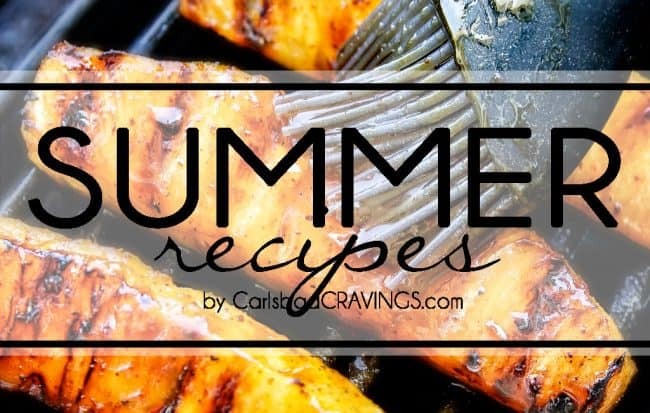 Bake at 400 degrees F for approximately 12-16 minutes or until salmon is cooked through and flakes easily with a fork (cooking time may vary depending on thickness of salmon, see note)* Broil salmon and veggies for 1-2 minutes or until salmon is golden. 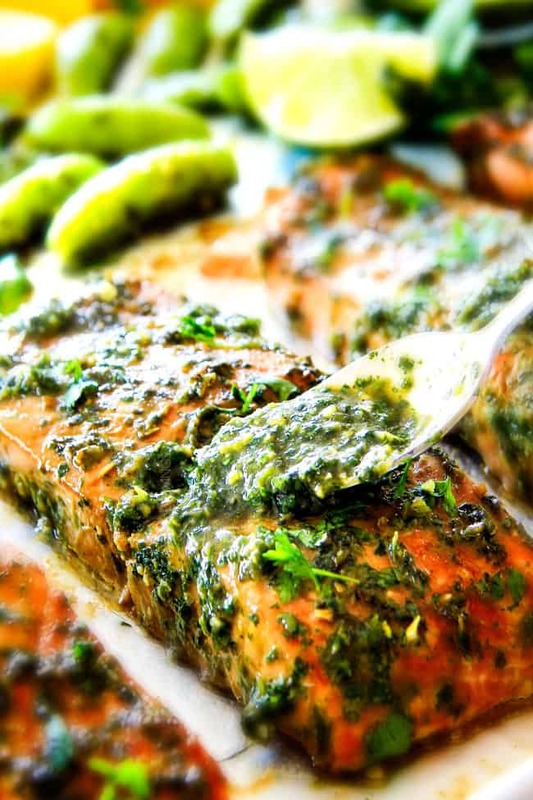 Spoon additional Chimichurri over salmon if desired (taste first). I still want to rave about the sheet pan salmon. My family and I love it so much. I’ll bet this one with chimichurri sauce will have the same delish component! This looks outstanding~! I just printed your recipe, but I see more to try. I think we are sort of neighbors. I’m in Rancho Santa Fe, and Seaside Market is my favorite market (my husband’s favorite place is VG’s). I’m so glad you have a blog. I’ve just recently gotten back into cooking and your recipes look so good. Oh my goodness, we are totally neighbors! I lived in Solana Beach for 5 years and love Seaside Market! That is so awesome you have gotten into cooking again, it can be so fun when you have good recipes! 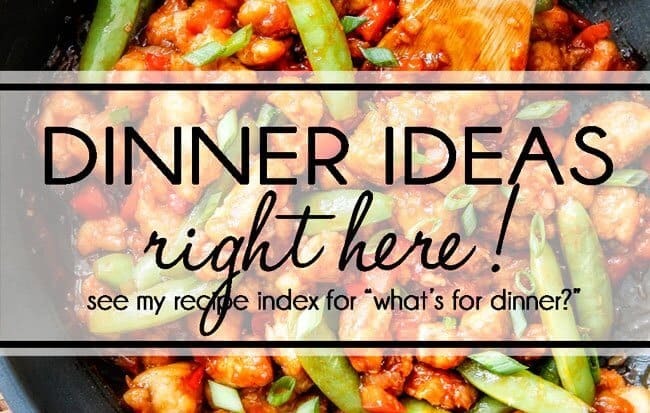 I hope you have fun exploring my recipes and hopefully find many new favorites! Thanks for saying hi!